Squash House Quilts: New Ruler and 9-Patch Challenge Fun! This past summer in Sisters I met a fellow blogger, Cindy of Sew Cindy. Cindy is the most terrific gal, and her husband and 3 Weimaraners are pretty special, too! Cindy met me with a wonderful package full of goodies - so unexpected and so very sweet! One of them was a Schnibbles kit that I have been dying to make and finally got around to starting yesterday. The kit was full of Civil War fabrics - my favorites! I had also read somewhere recently that a great way to cut charm squares, layer cakes and other pre-cuts was with the June Tailor Quarter Cut or Shape Cut Ruler. Normally I don't go in for specialty rulers like this, but I had a JoAnn's 50% off coupon and didn't really "need" anything, so I decided to try one! I chose the Quarter Cut Ruler over the Shape Cut Ruler as it has indentations at the 1/4 inch mark - I thought for my purposes it might be more useful! If you click on the photo, you'll see the 1/4 inch indentations a little better. In no time at all I had a huge stack of 2 inch squares cut! I placed the 5 inch squares under the ruler and sliced, then lifted the ruler up and placed it opposite to my first cuts and sliced again! I felt I had a lot more accuracy -- and some fun as well! 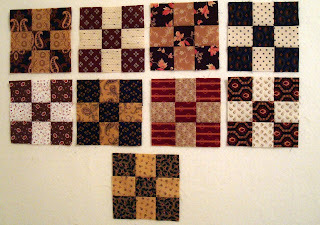 Here is what I've sewn so far - eleven more of these to go, then setting blocks and borders! I've also joined Anne Marie's 9-Patch Challenge - and this will count as my first project for the challenge! Notice I said "first project" -- I really do hope to do a couple more before the challenge ends - after all, it's about using up stash and goodness knows, I have a lot!! A while back I bit my lip and changed to the new Blogger designer which has been out for some time. I know others have had problems with it, but so far I'm liking it OK. The fonts sizes are a little different from the old Blogger, so if you're wondering why my posts fonts aren't consistent - it is because I'm trying different types out! Tomorrow I hope to have pictures of something we recently acquired on our trip to the big city! Candace, your 9 patches are gorgeous. Love repro fabric too. I have that ruler and am going to have to try that!! Looks like a great way for some scrappy 9s. How fun that you got to meet Cindy!!! The nine patches are wonderful. Cindy seems to be alot of fun from her wonderful blog. I'm not into specialty rulers either but there are some really handy dandy ones out there. Have fun with your Civil War nine-patches. Looking forward to all of your challenge projects. Cindy is a sweetie. That looks like a very useful ruler. I have had the Shapecut for years, but I really like the idea of the 1/4" cuts. Hmmm, have to think about that. Thanks for the review! Your ruler sounds very useful as you don't need to shift your fabrics many times. The nine-patches are very beautiful. I agree Cindy is a sweetheart. Your 9 patches are looking great. 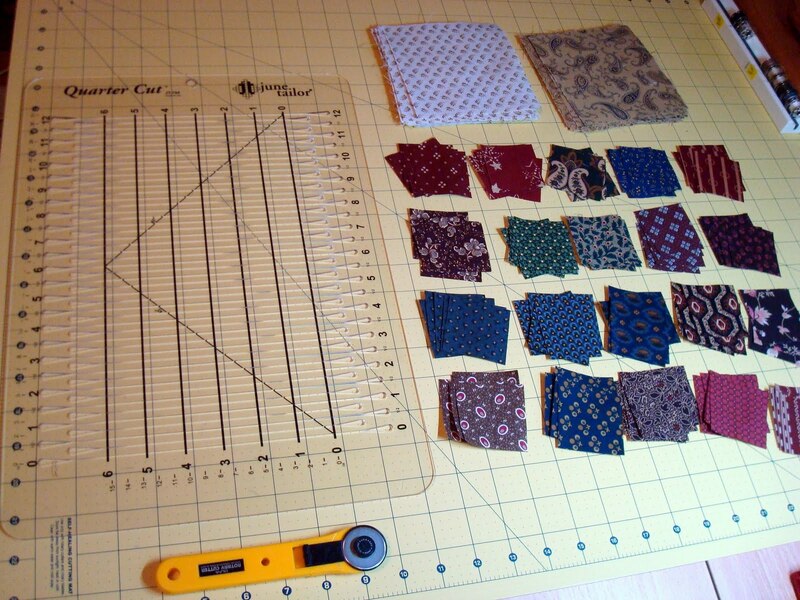 Going to make a beautiful Schnibbles quilt. Well that is the way to get those pieces cut in a hurry. Cool. Can't wait to see what you got in the city. I have a June Tailor ruler somewhere that I've never used. I need to go check it out! Thank you for your kind words, Candace. Looks like you're getting the Schnibble put together fast. 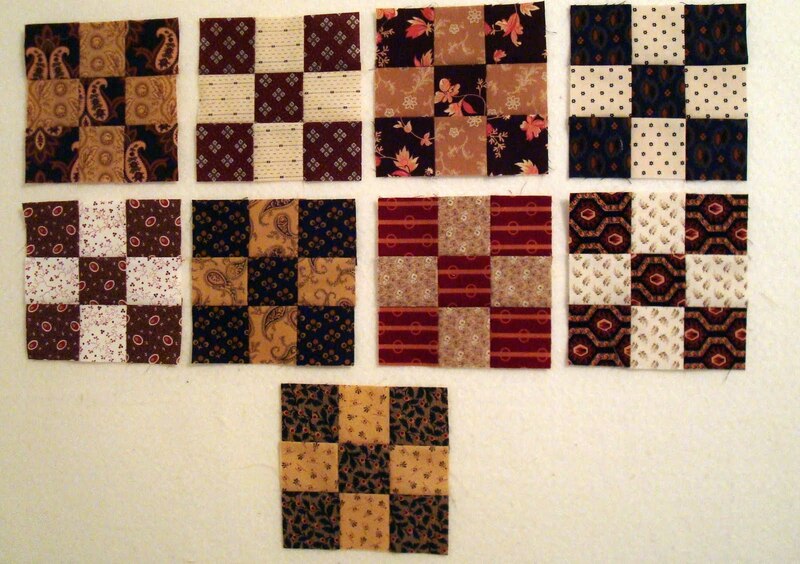 I just love nine patches - traditional.